The Key Issues in Marketing Management book series, published by Routledge, contains a wide range of the JMM’s special issues. These special issues are an important contribution to the work of the journal, where leading theoreticians and practitioners bring together articles dedicated to a key topic in the industry. Through publishing these special issues as a series of books, Westburn Publishers and Taylor & Francis hope to allow a wider audience of scholars, students and professionals to engage with the work of the Journal of Marketing Management. Gendering Theory in Marketing and Consumer Research showcases state-of-the-art scholarship on gender in the field of marketing and consumer research. The book presents seven original contributions by a group of internationally renowned academics, who take up the task of theorising gender and gendering theory in new ways, accommodating recent intersectional, material-discursive, and practice-oriented theorisations. Connecting the study of marketing and consumer behaviour to different theoretical perspectives on gender, the contributors explore and critically examine the gendered nature and dimensions of contemporary marketplace activity. Through innovative conceptual development and insightful empirical analyses, the book offers important scholarly contributions to the literature on gender, marketing, and consumer research, and advances our understanding of gender as lived experience and socially regulated performance. It also frequently employ an intersectionalist perspective, theorising gender as only a part of one’s subject position, which is constituted by mutually reinforcing categories. The book will be essential reading for students, scholars, and practitioners who are interested in the implications and contemporary manifestations of gender as a cultural category in the marketplace. Marketing Performativity: Theories, practices and devices addresses concerns about the theory-practice gap so often discussed by marketing scholars, and indeed reframes this ‘gap’ by asking ‘how is marketing theory performative?’ How does marketing theory shape action? Who uses it in practice and to what effects? The individual contributions in this book look at how marketing theories are used in practice and what this means for our understanding of the practicing–theorising landscape of marketing. The book begins by considering what performativity is and how this concept is used in the marketing literature. It then considers three themes concerning the performativity of marketing that emerge from the contributions, before presenting ten empirical studies that ask how, why, and to what effect marketing theories are used and ‘performed’ in marketing practice. The book also summarises the implications of three themes and sketches research areas for further developing our understanding of the performativity of marketing. This collection of articles deal with marketing history and the history of marketing thought, placing these subjects within a marketing management context. Despite the crucial role that historical research can play in expanding our understanding of marketing, studies of the history of marketing are thin on the ground. This volume aims to address this gap. Topics include the history of the Boston Consulting Group’s growth-share matrix, branding, the emergence of marketing schools of thought, managerialism, the marketing concept, relationship marketing, scientific management and marketing, and critical marketing studies. 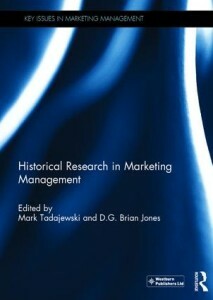 The introduction discusses the three themes that run through the collection: historical method, marketing history, and the history of marketing thought. When marketing managers and financial managers join forces within any business, the result can often be poor communication on financial criteria and goals. The risk of this situation occurring is inevitably present when those with different professional backgrounds and roles are working in accordance with their own norms. In his seminal 1956 paper on general systems theory, the economist Kenneth Boulding referred to the phenomenon of “specialised ears and generalised deafness”, which can be seen to exist when marketing managers are financially illiterate or when financial managers lack the necessary insights to design, implement and operate accounting systems which are useful to marketing managers in carrying out their roles. It is increasingly difficult to attach credence to the idea of marketing managers who lack financial skills, or financial managers who fail to relate to the context in which marketing managers operate. Understanding the marketing/accounting interface is therefore important in generating emergent properties from the interaction of marketers and accountants whereby the whole is greater than the sum of the parts. The chapters in this volume seek to address this challenge. In recognising the realms of eco-marketing, sustainable marketing, social marketing and ethical consumption, this collection provides an accessible overview of the multifaceted and challenging nature of green and ethical issues. In revealing that there are many ways to explore the consumption activities of green and ethical consumers, the contributors point to some of the weaknesses identified in previous marketing research. The book also considers fundamental ways in which marketing academics and marketing practitioners can gain a more holistic understanding of the demographic, psychological and socio-cultural influences upon the green and ethical consumer. The contributors offer insights underpinned by holistic and cross-cultural perspective. As a result, this collection will advance marketing theory as well as offer valuable implications and recommendations for managers, practitioners and policymakers, the joint efforts of which are needed to ensure a more ‘green’, ethical and sustainable marketplace. Practitioners of marketing in higher education and all academics across all disciplines who work in higher education are aware of the importance of marketing to their careers, their department, and their institution. Chancellors, University Presidents, Deans, Heads of School, Directors of Research, Directors of Programs and faculty, as well as those who work in departments of marketing within higher education institutions, recognise the increasing utility of marketing what they have to offer. Our purpose in this research based book on higher education marketing is to bring to the diversity of these publics a more sophisticated way of thinking about, and methods for, marketing higher education. With globalisation taking centre stage in the business world and multiculturalism affecting markets and societies, there is a need to understand the ways that customers respond to the changing marketplace from international and multicultural perspectives. This book is timely in addressing important themes raised in the most recent marketing literature, such as: global consumer culture, and the impact of Western culture on consumer behaviour in other countries; consumer acculturation processes, and the impact on identity conflicts and the strategies people use to manage them; globalisation vs. localised strategies, and the interaction of local and global influences on customer behaviour; climate change and global warming, the impact on consumer behaviour, and the implications for social responsibility; and cross-cultural customer research, including important methodological questions around the application of sociological, group-level measures to psychological, individual-level phenomenon in marketing contexts. The papers in this edition address those themes, reporting on studies from a range of countries, including Germany, Greece, China, and Austria, and a number of cultural groups in the UK. These papers draw on quantitative and qualitative methodologies, reflecting the full range of methods employed in contemporary consumer research. There can be little doubt about the profound impact that the Internet has had on all aspects of business over the past decade. Indeed, it is now widely accepted that we have entered a new and even more revolutionary phase in the development of the Net as a global marketing and communications platform; a phase characterised by information ‘pull’ rather than ‘push’, user-generated content, openness, sharing, collaboration, interaction, communities, and social networking. New generation Web-based communities and hosted applications are beginning to have a major impact on customer behaviour across a diverse range of industries. These new applications represent a fundamental change in the way people use the Internet, their online expectations, and experiences. From a marketing perspective, the most distinctive feature is not the technology involved but rather the growth of a new global culture – a ‘Net generation’ culture based on decentralised authority rather than hierarchy and control, online socialising and collaboration, user-generated and distributed content, open communications, peer-to-peer sharing, and global participation. Success in this new online environment, characterised by people and network empowerment, requires new ‘mindsets’ and innovative approaches to marketing, customer, and network relationships. This book makes a valuable contribution to the field by examining recent and future developments in online marketing, including the revolutionary impact of new media. Chapters cover a wide range of topics, including: information exchange on bulletin board systems and in online consumer portals; Web 2.0 and ‘New-Wave Globals’; online tribal marketing; co-creation; industry impact; privacy issues; online advertising effectiveness; and practitioner prognostics for the future of online marketing. Expanding disciplinary Space: On the Potential of Critical Marketing provides an introduction to the major perspectives in critical marketing studies. It contains theoretical reflections on critical marketing whilst building on the key concepts and ideas, which are vital to the subject, through detailed empirical studies. An international collection of marketing experts discuss the eclectic character and potential of the critical turn within marketing theory and practice. Chapters explore topics such as marketing academia, consumer research, political marketing, marketing ethics, postcolonial epistemic ideology in marketing, marketing theory, and marketing for community development. The text is essential reading for all those interested in contemporary developments in marketing theory and practice irrespective of the discipline from which they originate. Arts, heritage, non-profit and social marketing today comprise key components of the contemporary marketing management scene. Governments, charities and voluntary sector organisations throughout the world are increasingly involved in the development of marketing campaigns, and more and more of these organisations are likely to be at the cutting edge of the application of the very latest marketing methods. Research in the arts, heritage, non-profit and social marketing fields is intellectually rigorous, relevant for user communities, and has a great deal to offer to marketing theory as well as to promotional practice. This book presents a collection of stimulating articles that report some of the freshest and most innovative research and thinking in the authors’ specialist domains. Collectively the chapters offer a balance of empirical and conceptual research in arts, heritage, non-profit and social marketing. They explore new ideas, challenge pre-existing orthodoxies, develop knowledge, and demonstrate the epistemological importance of current research in these critical areas. Articles picked by the Editors of JMM to highlight examples of original and thought-provoking research in the areas of Alcohol & Drinking Behaviour, Celebrity and Gender. Articles picked by the Editors of JMM to highlight examples of original and thought-provoking research in the areas of Fashion and Luxury, Social Marketing and Social Media. Articles picked by the Editor of JMM to highlight examples of original and thought-provoking research in the areas of Dark Side of Marketing and Family Consumption.